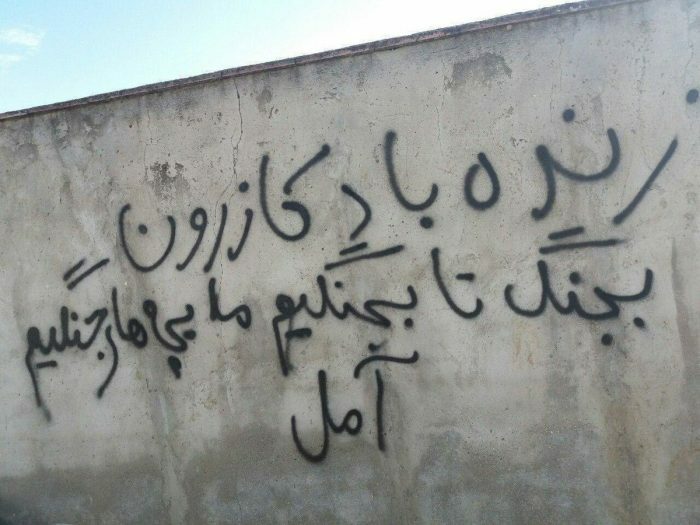 Wall writing by MEK resistance units a way of expressing opposition to the current dictatorship ruling Iran. 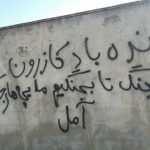 The sign hails the people of Kazeroun for their uprising and expresses readiness to continue the struggle against the religious dictatorship. The Iranian regime has spent the forty years of its existence trying to demonize and delegitimize the MEK. Its primary strategy to accomplish this goal has always been to portray the opposition organization as a fringe group with little support within Iran. Over the past year, however, the mullahs have not only acknowledged the influence of the MEK within Iran, but they have also openly expressed their fears that the group could lead the people of Iran to topple the regime. Recently, Seyed Mohammad Saeedi, regime’s Friday prayer leader for Qom, central Iran, traveled to Mashhad to give a speech before the Friday sermon. Saeedi devoted part of his speech to the MEK, going so far as to acknowledge that the regime sees the MEK as an existential threat. Saeedi also acknowledged that the MEK is popular in Iran and enjoys broad support. The MEK has even gained support among working-class religious Iranians, leaving the regime in danger of losing its base. Saeedi further acknowledged that the MEK can rapidly spread information about the resistance through social media. He also noted the MEK’s use of resistance units in all of Iran’s cities. These statements have marked a departure from the regime’s long-held assertion that the opposition group held no influence within Iran and posed no threat. Support for the MEK within Iran has grown steadily over the last several months. The MEK’s resistance units have helped to organize and lead numerous protests and strikes, and many supporters have posted videos and pictures of these activities on social media. Other regime officials have shared their opposition to passing any restrictions on the financing of terrorism, voicing similar concerns. Friday prayer leaders do not offer their own opinions or speak from a place of low status. These clerics are the mouthpieces for regime Supreme Leader Ali Khamenei. Their speeches and sermons are written from talking points given to them from the highest levels of the regime. The fears they speak of are the fears of Khamenei and his inner circle.